Dental implants are human-made replacements for the root of the tooth. They can be used to fix broken or missing teeth due to injury, periodontal disease, decay or congenital defects. They can replace a single tooth, several teeth, or an entire upper or lower jawline. They offer permanence and durability, due to their titanium construction, and look similar in size and shape to the natural root of the tooth. After implant, the titanium fuses with the cells within the jawbone. The process begins with a three-dimensional scan of the jaw to find existing bone and its depth along with locations of nerves and sinuses. This allows your dentist to ensure that the implant is safe, with no unnecessary pain or complications. When placing the implants, your dentist will use computer software to ensure exact placement. 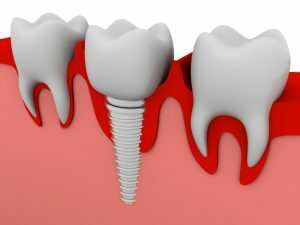 After the implants are placed and a period of healing has passed, your dentist will then design a new restoration to rest on your dental implants, using an abutment. This is a connector built into or placed on top of the implant, providing a surface for the crown or bridge to attach to. The healing time for dental implant procedure is typically at least three weeks, but this varies depending on each patient’s ability to heal. The better the health, the quicker the recovery process. As a note, sinus or jaw augmentation procedures require additional healing time. The restoration is applied after the fusing and healing of the implant. The closest replication of natural teeth, dental implants offer strength and stability. By replacing missing teeth, they help maintain the structure of the mouth and jaw. When teeth are missing it also affects your ability to chew food properly, which further impacts the digestion and extraction of nutrients. This can also cause a collapse of the facial structure, where the chin protrudes, and excess wrinkling occurs. Titanium has a success rate of 90-95% for bone health and fusing. In most cases, your dentist expects your implants to last for a lifetime. Success still ultimately depends on the proper care of your teeth, including brushing and flossing at least twice daily. Along with these practices, it is still important to maintain six-month appointments with your dentist for cleaning and examination. Dr. Yelena Obholz received her undergraduate degree from the University of Minnesota and her D.D.S. degree from New York University College of Dentistry. She completed a residency at Woodhull Hospital in Brooklyn, New York, where she did advanced work in periodontics, oral surgery and prosthodontics. She practices at Aesthetic & Family Dentistry of Washington, and can be reached for more information through her website.